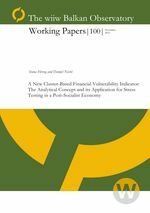 This paper proposes a new approach to household financial vulnerability analysis by employing cluster analysis techniques in the identification of potentially vulnerable households. The cluster-based vulnerability indicator is combined with a binary dependant variable model and used in stress testing. The proposed methodology is applied to householdlevel data for a post-socialist economy – that of Croatia – with the specific aim of testing the extent to which the prolonged economic downturn following the Great Recession of 2008-2009 might hurt indebted households. The paper compares the results based on the new approach with those based on traditional stress testing methods. Interest rate shocks had a stronger impact on household vulnerability in the traditional approach, whereas decreases in employment are found to be more disruptive in the cluster-based approach.